To preface my review I must state that I had never before read a book written in the “epistolary” style embraced by Jeffrey Cook in his novel, Dawn of Steam: First Light. This means that the main character narrates through journal entries and letters. He writes these to his fiancee back home about their journey. At first mention of what epistolary meant (a novel written as a series of documents, according to Wikipedia), I was highly skeptical that this technique would be engrossing for the reader. After reading the novel in its entirety, I am unconvinced that this style of writing can ever fully grab the reader’s attention and fully convey excitement. This style lent itself to multiple issues, the first of which was the lengthy descriptions of characters and pieces of equipment (such as how to re-load a rifle on page 53). The letter writer, Gregory Conan Watts, completely describes a person, sometimes spending pages and pages in his descriptions, instead of letting the character’s personality come through the pages of the novel organically as in a regular novel. The character descriptions were so long, I thought Watts was being obsessive or compulsive in his need to over-describe every character. The epistolary format contains multiple forms of documents and Jeffrey Cook included journal entries, letters, and newspaper clippings. I enjoyed having the variety, however, some thoughts were repeated in different forms of documents, such as how Sir James loses (Watts suspects on purpose) during card games. This might be a redundancy by the author by accident or perhaps is an acknowledgement that our narrator does not remember he has already written about this event, which is altogether quite clever though unnecessary for the reader to have to take note of twice. As epistolary is written after the fact, any action is not entirely exciting, as it has already occurred and there is no surprise to the writer, only the description of that past surprise. I thoroughly missed being in the middle of an action sequence throughout the novel, even as Cook was able to give me some of that anxiety for the characters with several action sequences involving fight scenes. Cook gives Watts the ability to describe the action scene of the fight in such a way to completely capture my interest, for at least that part, until the bulk of the narration of their experiences on their journey begin again. Truly, the book could have started with the second part, American Colonies The Civilized West, after 90 pages of description that can be summed up by the words, “they prepared for their journey.” At that point, I did not even have a full grasp of the characters, even with the pages of description, because I had not seen them in action and couldn’t quite put a visual to any one of them. Even the humorous parts are dulled by the style of writing as it was ‘written’ in the early 1800’s, as such will happen when you are true to your narrator’s own writing style. I applaud Jeffrey Cook for staying so true to the time period, but I was not pleased as a reader to have to wade through the word-glutted sentences and the staunchly level tone of the writer. I wanted emotion and reaction, but I got this instead, “I will acknowledge that, expecting no such thing and quite tense in anticipation of gaining another voyager among our company, and one of such note, I was quite unready for such a thing, and startled in such a manner as to greatly amuse everyone about, and sending my chair tumbling backwards – with myself, sadly, still in residence.” (page 56). Many of the novel’s sentences are structured like this, long and comma-riddled and difficult to follow. This was another way in which the reader was hampered in connecting to the characters and the story. Any big reveals were rendered into normalcy by Watts. When I wanted excitement, he told me that one of the main characters was actually a woman, but in such a way that it was not scandalized. I want the scandal. I want the big eruption of truth. As a reader, I want to be excited about what I’m reading. Regarding the physical book and format, I felt that since the entire novel was made up of documents, the appearance of the book should reflect those documents. The newspaper articles should have looked like newspaper articles, perhaps ripped out of their columns. The letters should have been ink blotted and in a readable but cursive style, such as the tease on the back of the book jacket. Also, Watts mentions photos he sends with his letters. I would like to see them and think it would add greatly to the novel’s authenticity for them to be included. There were only several grammatical errors within the script and I think these could be masked within the font as mistakes by the writer. Or even spelling errors, such as “Spainish” on page 171. I attributed this error to our narrator and not the author of the novel. 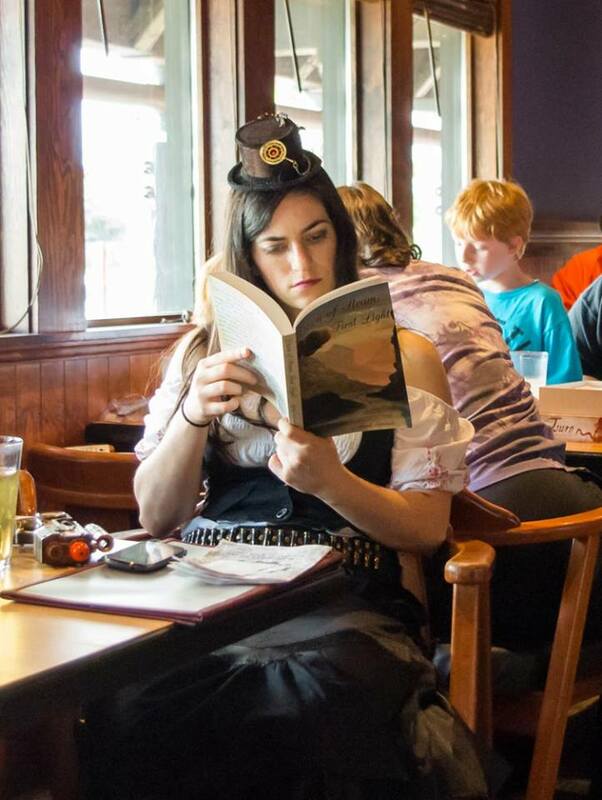 I am not entirely familiar with Steampunk as a genre and what elements and rules make up any book under that category. To me, though, this steampunk novel had an element that appeared to be gratuitiously placed to make it more reminiscent of the genre, such as the Ornithopter – a mechanical beast with part of the mind of a woman or a dog. This concept seems entirely out of place with the staunch historical accuracy of the book, lending to it a sense of unreality. – “Apparently expecting such a thing, and willing to put up with aiding in terrible behavior for a woman, I noticed Miss Penn tugging upon Samantha’s dress hem sufficient to catch her attention…” (page 166). – “I know it is unseemly, and I shall hope this letter is not widely circulated at home, save what parts of it are more of adventure and less of controversy….” (page 244). When referring to Miss Bowe wearing men’s pants when navigating. – “…for perhaps if she truly has such a gift for the manly pursuit of artifice, certainly well beyond my own understanding, then perhaps some part of her mind is entirely unsuited for womanly pursuits.” (page 97). In fact, Sam Bowe, when thought of as a man is “.. the fading and handsome, if youthful, man.” but when thought of as a woman, she is described as an, “…undignified woman.” (page 164). I would recommend this book to anyone who enjoys historical fiction and the epistolary writing style, steampunk, or the Luminaries by Eleanor Catton. This novel was published through CreateSpace Independent Publishing Platform on 2/27/14 and is available on Amazon here.